As the school year begins, so too does the Seafood in Schools pilot project from non-profit Seafood Nutrition Partnership. SNP is providing teachers across the country with a grant and supplies to bring tabletop fish and garden aquaponics systems into the classroom; along with this opportunity, some schools are even accepting the challenge to offer more seafood on their lunch menus. The Seafood Nutrition Partnership Seafood in Schools Aquaponics Pilot program is launching in 10 schools to teach students about how to grow and be responsible for fish and vegetables. As the school year begins, so too does the Seafood in Schools pilot project from non-profit Seafood Nutrition Partnership. SNP is providing teachers across the country with a grant and supplies to bring tabletop fish and garden aquaponics systems into the classroom. Along with this opportunity, some schools are even accepting the challenge to offer more seafood on their lunch menus. SNP is interested in helping the next generation understand the health benefits of eating seafood and learn about fish-farming technology that is a low environmental impact system for producing healthy food. Aquaponics combines aquaculture, a process for farming fish, and hydroponics, a process for growing vegetables in a soil-less medium, and the water is continually cleaned through this system. The aquaponics pilot is intended to help students learn about how to grow and be responsible for fish and vegetables, and to understand the basics of farming fish, seafood sustainability, the symbiotic relationships between fish and plants, and the health benefits of eating seafood. In Oklahoma City, Okla., Broadmoore Elementary School and Dove Science Academy High School, which is also working on introducing more seafood into the school lunch menu. Mr. Umit, superintendent at Dove Science Academy, experienced health improvements after taking the Healthy Heart Pledge and is very excited to introduce seafood nutrition to his schools. AJ Wittenberg Elementary in Greenville, S.C., where the teacher and the school’s foodservice team are working together to bring healthy cooking into the classroom, cooking with the food they are growing, and serving more seafood on the school lunch menu with guidance from SNP K-12 Ambassador Joe Urban. In Memphis, Tenn., an eighth grade science teacher at Aspire Haney Middle School and a fourth grade science teacher at Southern Avenue Charter Schools will introduce the program to their students, along with a non-profit agriculture education organization, Memphis Tilth. These organizations jumped at the chance to be a part of the pilot after it was announced at a coalition kick-off meeting earlier this spring. In Fairfax, Va., a teacher at Gesher Jewish Day School will utilize the curriculum with in fifth grade classroom. The Kanawha County, W.Va., schools are hosting a seafood week in their schools’ cafeterias in October, pairing that with the aquaponics systems in three classrooms: Andrews Heights Elementary School, Bridge/Clendenin Elementary School and Stonewall Jackson Middle School. “Through the Seafood in Schools Aquaponics Pilot, we hope students will learn about the importance of seafood in its role for supporting human health, environmental health, and the ability to sustainably feed future generations,” says SNP President Linda Cornish. 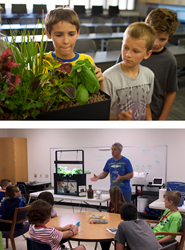 SNP is working with The Aquaponic Source, which is helping source products and provides the curriculum, and AquaSprouts, which makes the desktop garden system and will provide customer service to assist the teachers. Follow SNP, #Seafood2xWk, and the progress of these school projects on Facebook, Instagram, Twitter and Pinterest.